In the annual Ankara excursion, on 12-13 December 2016, the MEIA students visited on their first day the German embassy. The meeting at the German Embassy with Robert Dölger (Charge d’affaires) and Dr. Ralf Matthias Reusch (First Secretary, Political Section) was a long one that enabled the group to ask about various dimensions of Turkish-German-European relations. The second day started with a meeting at the Middle East Technical University (METU) where our course lecturer Prof. Atila Eralp was able to finish not only his regular class but also to provide the background knowledge on Turkey’s EU membership process. The MEIA delegation was also able to attend a guest talk by Assoc. Prof. Dr. Murat Erdoğan, a leading Turkish migration scholar at the Hacettepe University. In the afternoon the delegation visited the EU delegation and met an official from the political section. After an open discussion (and a nice surprise, as he told that this course’s lecturer Prof. Dr. Wolfgang Wessels was his professor many years ago) the MEIA delegation headed to its last stop, Turkish Ministry of EU Affairs. The students had a briefing on recent developments with regard to Turkey-EU affairs and were able to ask questions on current policy issues. Prof. Eralp from METU was with the delegation in all these meetings and played a major role in their organization. On the night of this second day the MEIA delegation arrived back at the Turkish-German University. 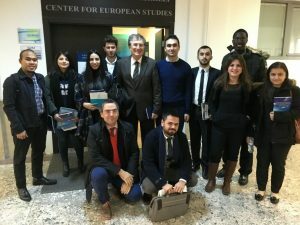 On December 12-13, 2016 the students of the Turkish-German University’s Master programme “European and International Affairs” went on a research and study trip to Ankara to gather first-hand insights into real-life policy making and diplomacy. Read more here.